THE sporting gods were in benevolent mood in the summer of 1987. In the space of 13 earth-shaking days, Lionel Messi and Diarmuid Connolly – athletes whose deeds would subsequently shake their respective audiences to the core – were sent fort from Olympus. A vintage harvest of genius. Last Saturday, Messi, unveiled his latest moment of gorgeous voodoo. A left-footed brushstroke of such heart-soaring perfection that the inclination was to place it in a gilded frame and inform the curator of The Louvre to clear a prime space among their gallery of treasures. A fleeting moment of accomplishment so superior as to demand eternal exhibition. A goal that was artistically transcendent, a masterpiece of such absurdly breathtaking beauty that, even as the dagger entered their ribcage, the Real Betis fans, suspiciously close to rapture, rose as one to pay homage to their assassin. "Messi, Messi, Messi," came the deferential chant from the Seville bowl, 56,000 as one worshipping body, bowing reverently, deliriously, like citizens of Ancient Rome serenading a conquering Caesar down the Via Appia on his return from a distant battlefield. Twitter swooned, the Argentine divinity’s latest gift to his flock unspooling on an endless celestial loop. For Barcelona’s harbour light, it completed a mesmeric hat-trick. The 51st of a pyrotechnic career. The words of Pep Guardiola came rolling down the years: "Don’t write about him. Don’t try to describe him. Just watch him." At the same time as the prince of the pampas was showcasing his latest otherworldly invention, Dublin were enduring their most painful Allianz League night of Jim Gavin’s eminent tour of duty. A third league defeat from six starts, Tyrone ransacking Croke Park and football’s natural order, had the effect of a barring order. For the first time in seven seasons, the Leinster giants are locked out of the NFL final. 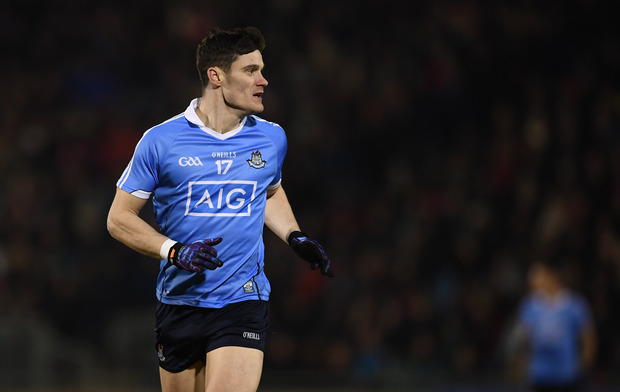 Connolly, who has played just 24 minutes in Sky Blue since his majestic second half cameo in the 2017 All-Ireland final eased Dublin away from the shadow of creeping doubt, was again the elephant in the room. As of this morning it is 388 days since, perhaps, the most naturally gifted Gaelic footballer of his generation, one unrivalled in his ability to send waves of authority across the old coliseum, the Marino Messi, exited the inter-county arena on an unremarkable night in Castlebar. Among the foundation stones of the Jim Gavin supremacy is his disinclination to smash the emergency glass at the first hint of smoke. As a manager, he doesn’t do panic or over-reaction. His aviator’s training kicks-in. Under the most blinding lights, his trademark is his stoicism. It has served Dublin brilliantly. Sixteen trophies in six and a bit seasons has carved Gavin’s likeness on the managerial Mount Rushmore, while securing his extraordinary team’s place in history. They rightly remain short-priced favourites, even after this first exhibition of springtime fragility, to boldly go where not even the greatest of their predecessors have gone before: the five-in-a-row; Nirvana. If there has been a recurring theme of weakness during the league it has been a slackness through the spine. Dublin, without their belligerent sentry, Philly McMahon (the six-time All-Ireland winner has only just returned from injury and is yet to feature in 2019) have looked particularly vulnerable under the high ball. The offensive mark, which will disappear come championship-time, appears to have exaggerated their defensive discomfort. It has led to some speculation about whether Rory O’Carroll’s recent return from New Zealand – he has been in inter-county exile for three years – might be timely. And, then, there is the Connolly conundrum. Exiting Croke Park on Saturday evening, many supporters would have passed the Croke Villas site. It was on those walls, 18-months ago, that a mural celebrating the St. Vincent forward’s capacity for sorcery, appeared in a great splash of celebratory colour. The urban art offered a reminder, on a night when Gavin was untypically critical of Dublin’s players and, particularly, their shot selection, of Connolly’s unique game-changing skills. The X-factor dimension he offers. Messi illustrated the way a star’s genius shifts the odds on Saturday. His great rival, Cristiano Ronaldo, did likewise days earlier with the Champions League hat-trick that broke Athletico Madrid. There are any number of variables standing, like a barbed fence, between Connolly and a Dublin return. Firstly, there are Connolly’s own ambitions. It was his decision to depart the panel, a personal choice to relocate to Boston rather than commit to another pressure-cooker summer with the All-Ireland champions. That was his absolute entitlement. Is he himself ready to return? If the answer to that question is positive, then Gavin must decide if the distraction of the inevitable media circus, which would follow a recall outweighs the natural-born blaze of brilliance that might accompany the sight of Diarmuid back in blue. Connolly’s ability to score or find a team-mate from almost any angle or range are the rarest of gifts, the most priceless of assets. His calling card, on those days when he makes the impossible seem so routine, is an ability to thieve the breath. Messi, born under the same sign of the Zodiac in the same summer of ’87, delivered such an intervention on Saturday, leaving friend and foe alike gape-jawed and feeling lucky to be alive. For the romantics, it also fuelled the most tantalising of images. It is the one where his blood-brother in the family of miracle-makers steps back into uniform, where Connolly sprinkles one last sequin of stardust on summer’s days of thunder.